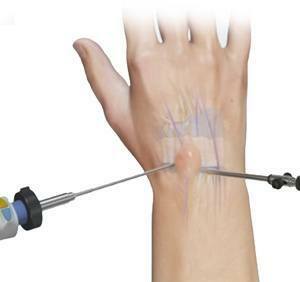 Your doctor will diagnose ganglion cyst by performing a physical examination. Your doctor may apply pressure to the cyst to identify any tenderness or discomfort. The region may be illuminated with a torch light to determine if it is solid or filled with liquid. Additionally, X-rays, MRI or ultrasound may be ordered to help rule out tumours and arthritis. Diagnosis is confirmed by needle aspiration, where a thin needle is inserted into the cyst and the fluid is removed. The fluid in a ganglion cyst will be translucent, or thick and clear. Often, Aspiration is the first line of treatment suggested by your surgeon. Your hand surgeon will clean the skin around the cyst and numb the region using local anaesthesia. A syringe is then inserted into the cyst and the fluid is drained out. Your surgeon then injects a steroid to prevent reoccurrence and places a bandage over the site of injection. Surgery can be open technique or minimally invasive with arthroscopy, where a small camera is inserted for the surgeon to clearly view the area of operation. The surgery can be conducted under local or general anaesthesia. The area of the ganglion cyst is cleansed and an incision is made across the cyst. The contents of the cyst are then excised along with its root and the opening is sutured and bandaged. Ganglion cysts are fluid-filled sacs in the hand or feet. They are harmless and gradually subside, but pain and immobility may require treatment. Non-surgical and surgical procedures are safe and are associated with minor risks and complications.